This set of Geotechnical Engineering Questions and Answers for Aptitude test focuses on “Construction of under – Reamed Pile Foundation”. Explanation: The equipment required for the construction of pile are i) Auger boring guide ii) spiral auger with extension rods iii) under-reamer with soil bucket and iv) concreting funnel. Explanation: The used of boring guide is essential in order to keep the bore holes vertical and also in its position. 3. Which of the following stages are involved in the construction of under reamed piles? Explanation: The various stage involved in the construction of under reamed pile foundation are i) boring by auger ii) under-reaming by under-reamer iii) placing reinforcement cage in position iv) concreting of pile caps, plinth beams and curtain walls. 4. The depth of the bore hole is checked at _________ before insertion of the under-reamer. Explanation: The depth of the bore hole is checked each time before insertion of the under-reamer so that any loose earth spilled from the bucket is removed. Explanation: Routine test should be carried out on test piles while initial test are preferably carried on test piles. Explanation: Boring is done with the help of spiral auger, present at the circular collar of the guide assembly. Explanation: Under-reaming or enlarging the stem of bore hole at the required depths is achieved by means of the under-reamer consisting of a set of two collapsible blade assembly. 8. For completion of one under-ream, how many buckets of earth are required for removal? Explanation: Generally, removal of eight buckets full of earth is required for completion of one under-ream. Explanation: Pile groups may be tested as both free standing piles or piled foundation by applying series of load. Explanation: The dimensions of the bulb can be checked by means of a graduated G.I. pipe assembly. 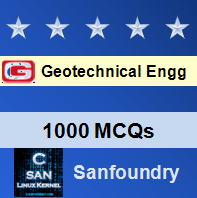 To practice all areas of Geotechnical Engineering for Aptitude test, here is complete set of 1000+ Multiple Choice Questions and Answers.